I first heard the word Gremolata a few years ago when my editor at Fitfare on the Wellfed Network told me she would be writing for an online food magazine out of Canada with that name. Intrigued, I googled it and found this, and this. I don't really see myself ever making Ossobucco alla Milanese and I wasn't sure what else might go with it, so I filed it away for future reference. It hovered there at the back of my mind, though. I did not use much parsley in my cooking at the time, although it was creeping into more and more of the foods I was cooking, especially as my palate turned toward Italy and the Mediterranean. At first I was only buying it for specific uses, when recipes called for it. Having grown up with the obligatory munching on curly parsley at the Passover seder every year and the ubiquitous garnish on every single plate served to me at restaurants, from the local cafeteria to the rare night out at a "fine dining" restaurant, I could never really look at parsley as a food item. It had the same appeal to me as those green plastic leaves that sometimes grace the plate at sushi restaurants. Actually, it was my sister who first got me to see parsley as food. I have mentioned before that she was always ahead of the pack in discovering the latest health trend and, believe it or not, parsley was one of those trends. I don't remember all of the details as it was quite some years ago, before I moved to Chicago, but I was at her house for dinner and she made what I can only describe as a parsley pesto, which she served over spaghetti. I don't remember begging her for the recipe or anything, but I do remember being pleasantly surprised that something I had considered as less than a garnish could hold its own as an entree. I credit that early meal with my willingness to start accepting the use of parsley in my kitchen. I didn't use it often, and I used it more as an accent in my cooking than an ingredient until I discovered flat-leaf parsley. I don't remember when I first noticed that there were now two kinds of parsley available at my local grocery store, but the flat Italian parsley was less bitter and more flavorful than its curly counterpoint, and once I had my first taste of that I was not so reluctant to bring it home with me. At about the same time, I was discovering Greek and Middle Eastern foods, both of which rely heavily on the use of parsley. But I still mainly saw it as a garnish rather than an ingredient. Until I had my first taste of tabbouleh from a restaurant, which was mostly parsley, accented with bulgur, tomatoes and cucumbers and tart with lemon juice. By that time, I could really taste the parsley and realized that I loved its fresh, grassy flavor, and how it could brighten up almost any dish. 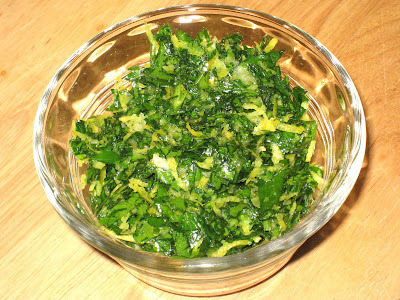 I found myself thinking about gremolata more frequently, but still just as a thought that I should make it some day. Not having any specific uses for it in mind, it was one of those dishes that always came into my head after I had just finished cooking, or when I was planning future meals, but never at that particular moment when the thought will come to fruition and the dish will be made. A few years passed and I rarely gave it more than that passing thought of making it sometime in the future. Earlier this winter I was walking home from the train on a cold, wet, snowy day. Walking across the parking lot of Treasure Island, I got an incredibly strong craving for leek and potato soup. Which I have never had or made before. I don't know from where the impulse came, but once it was there it became an imperative. So I picked up a leek, some potatoes, and a little bit of hard sausage and went home to improvise. I was somewhat pleased with the outcome, but it was a little on the dull side. I needed something that could brighten it up. If I hadn't had lemons and parsley in the crisper this probably never would have happened, but I realized I could make gremolata, and leek and potato soup might be a good companion for it. So I zested a lemon, chopped up some parsley, and mashed a few cloves of garlic and mixed them together with salt and a little olive oil. I spooned the result over a bowl of the soup. And I was amazed at the transformation. It went from being a ho-hum little inoffensive meal to a dish that was singing with flavor. I couldn't believe how good it was, and how much it transformed the soup. Because it uses lemon zest but not lemon juice, you get that concentrated lemon flavor without the tartness - the lemon, parsley, and garlic flavors are separate but equal, unlike the (also delicious, don't get me wrong) more unified flavor you get when you add lemon juice, which brings the flavors together more subtly. I also had plans for salmon with dill rice and peas, which I cooked the next day. When I added the gremolata to that (you can see it in the picture in that post), the flavors really burst out of the bowl. Bright, fresh, tangy, lemony, grassy, ending with a flash of bite from the garlic, it made me very happy, I can tell you that. It's best served over a warm or hot dish. The heat causes the ingredients to wilt together and softens the garlic so it has just that little bit of sweetness and loses a bit of its bite. I also love how economical this recipe makes me feel. Whenever I need fresh lemon juice (which is on a regular basis), I will zest the lemon first and throw together a batch. It's one of few garnishes that I will decide to make, and then decide what to make for it, rather than the other way around. I challenge you to make this just once. I am convinced that you will fall in love with it just as much as I did. I came up with this recipe from several I found online. The main difference is that about half of them used a small amount of olive oil and half of them didn't. I liked it better with just a bit of oil. Even that small of an amount becomes infused with the other flavors and blends them all together beautifully.